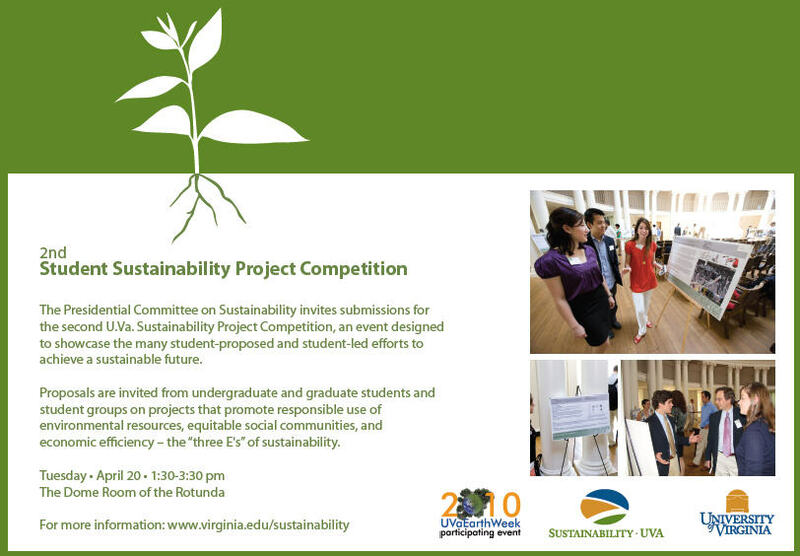 Please consider participating in the 2nd Annual Student Sustainability Project Competition described below. The top 20 submissions will be selected to present their work in the Dome Room of the Rotunda, and a team of judges will select the top three presentations. Last year’s winner was a SEAS student! Lecture Series sponsored by the Rodman Scholars Program at the University of Virginia, open to the University community and general public. Lockheed Martin has generously sponsored this years lecture series as a part of the larger Lockheed Martin Sustainability Grant to the Rodman Scholars Program. Lectures will generally be held on Tuesday nights at 5. All lectures will take place in Jefferson Hall (Hotel C) on the West Range. Curious how UVA is designing with sustainability in mind? Come hear Andrew Greene talk about UVA’s plans for reducing its environmental impact. From several hundred year old Lawn rooms to the brand new South Lawn Project the university faces many challenges in engineering and designing a more environmentally friendly university. Are you an undergrad doing research and need money? We will provide $3,000 each for up to five sustainability-themed projects. Please visit our website and apply today! Deadline for submission is December 4th. Rocky Mountain Institute (RMI) has unveiled Green Footstep, a free online carbon calculator for reducing carbon emissions in building construction and retrofit projects. Compliments a financial model (based on life cycle cost analysis) to provide the most comprehensive support for building design decisions.